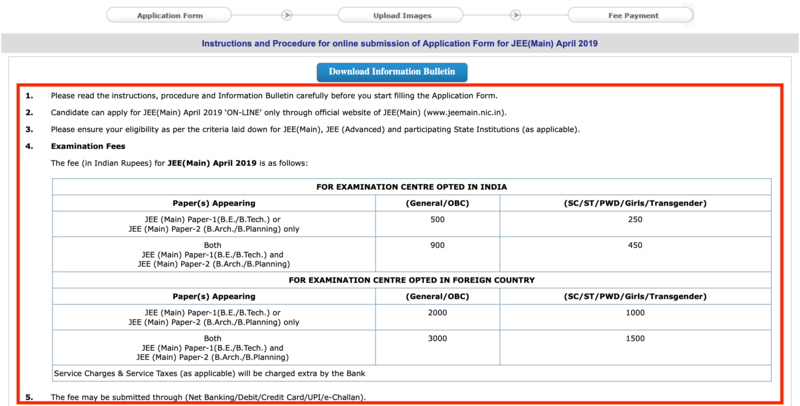 Application form for JEE Main 2019 April exam is closed now. 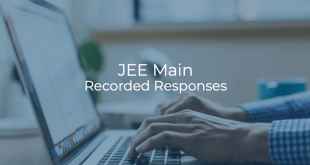 UPDATE (Feb 8, 2019, 1:45 PM): JEE Main 2019 April Exam Registrations started, read more here. 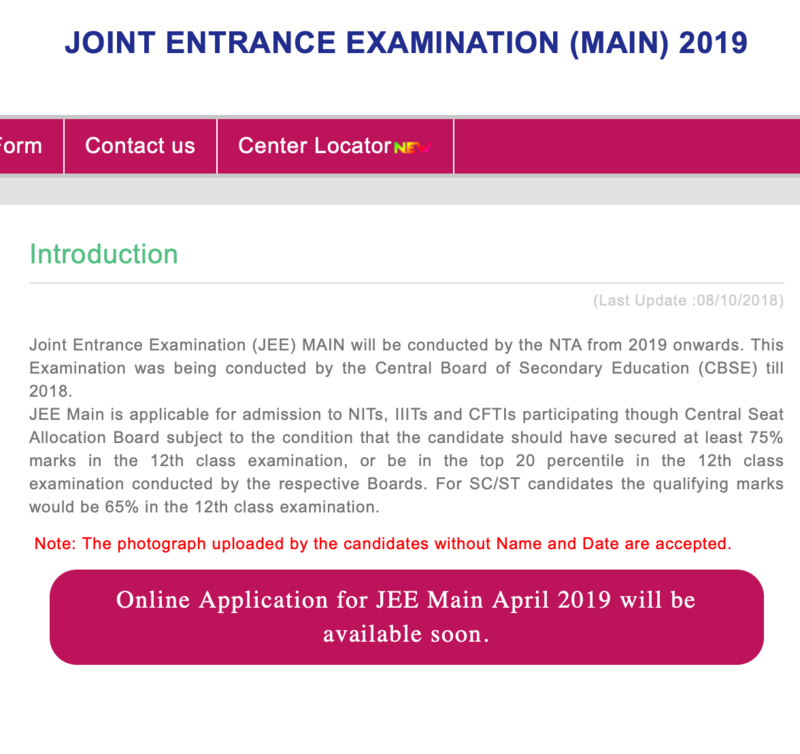 UPDATE (Feb 8, 2019, 1.30 PM): NTA has released the brochure for JEE Main 2019 April exam. Candidates can check the brochure here. 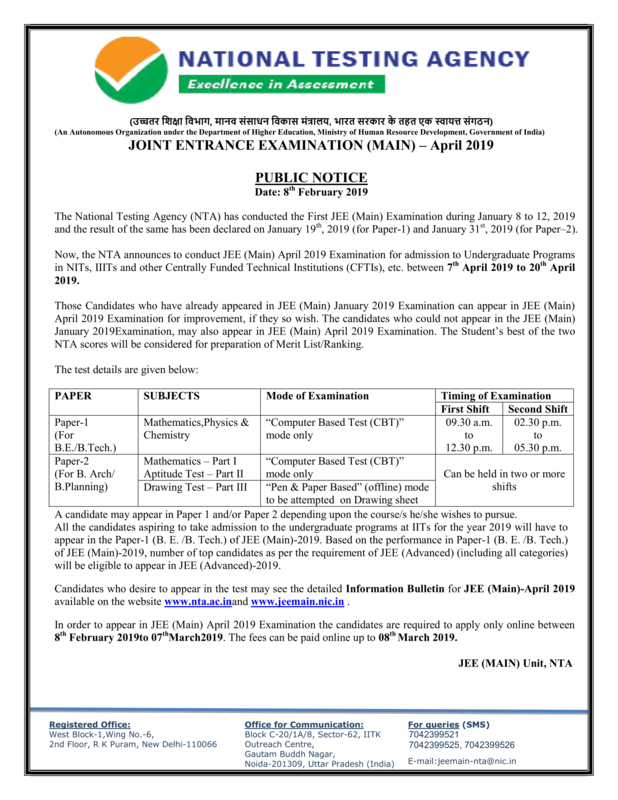 UPDATE (Feb 8, 2019, 10 AM): NTA has released the complete notification for JEE Main 2019 April exam. 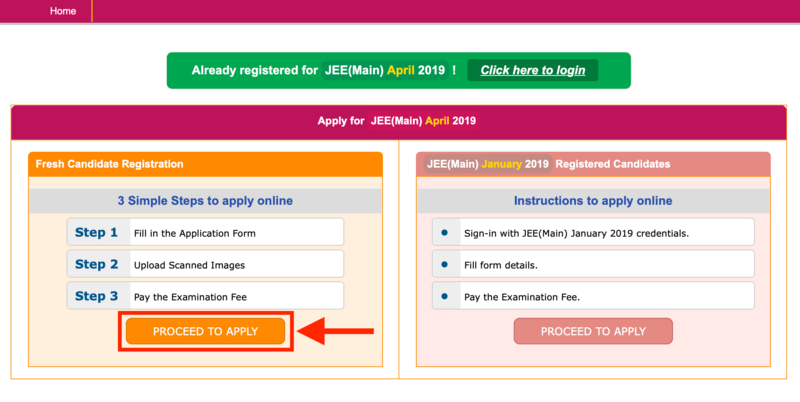 UPDATE (Feb 8, 2019): Official Website banner has been updated with “Online Application for JEE Main April 2019 will be available soon.”. 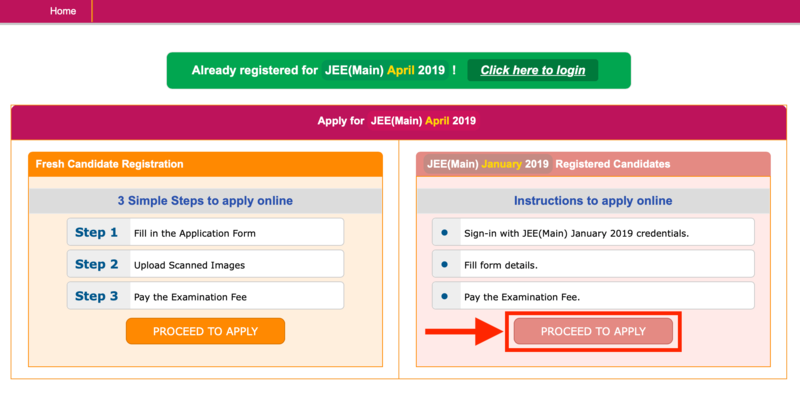 JEE Main 2019 April exam registrations have started from February 8, 2019. The last date for filling up the Application Form is March 7, 2019 (upto 11.50 PM) while the fee can be paid upto March 8, 2019. Check other important dates here. The Application Form procedure differs for fresh candidates and candidates who appeared for Jan exam. 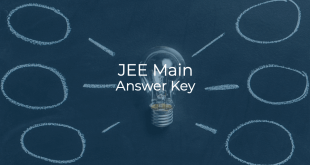 Visit JEE Main website and click on “Apply for JEE(Main) April 2019”. 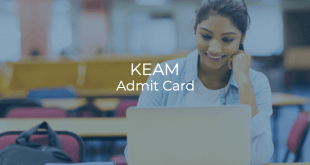 Click on “Proceed to Apply” under the heading “JEE (Main) January 2019 Registered Candidates”. 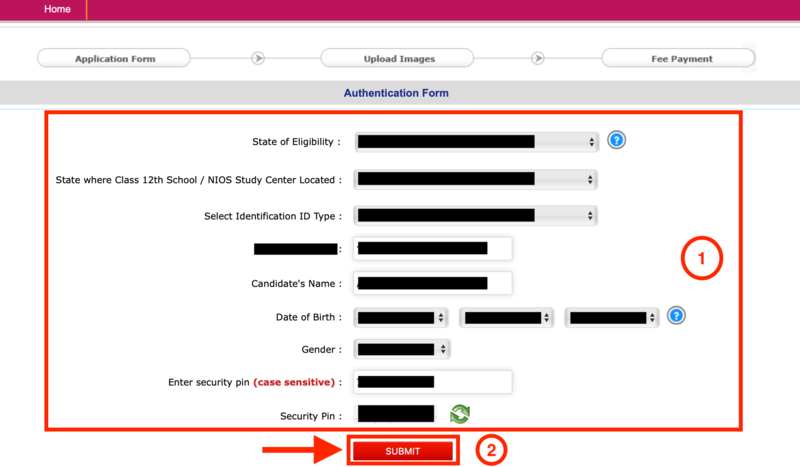 Enter your January 2019 examination Application number, Password, and Security Pin as displayed. Then click on “Login”. Pre-filled details of the Candidate as filled during January 2019 examination application will be displayed including Candidate’s name, Mother’s name, Father’s name, Category, PwD status, Gender, Date of birth, State code of eligibility. No further correction to these details is allowed. Fill the exam related details including the Choice of Papers you want to appear for, i.e. Paper-1 or Paper-2 or both, Choice of Question Paper medium and Test Center preferences. Pay the requisite Application Fees online using Debit/ Credit Card/ Net Banking/ e-Challan. After successful payment, save the generated confirmation page for future use. Application is not complete until the confirmation page is generated. Click on “Proceed to Apply” under the heading “Fresh Candidate Registration”. Instructions for JEE Main 2019 Application will be displayed on the screen. Read the instructions carefully. You can also download the JEE Main Information bulletin. After reading the instructions, check the checkbox “I have downloaded Information Bulletin, read and understood all the instructions” at the bottom of the page and click on “Proceed to Apply Online”. Choose your State Code of Eligibility (same as State where Class 12th School / NIOS Study Center Located). Enter your Personal Details including Name, Date of Birth, Gender and ID details. Enter the security pin same as displayed on the screen and click on Submit. You’ll be redirected to the Application Form page with pre-filled details. 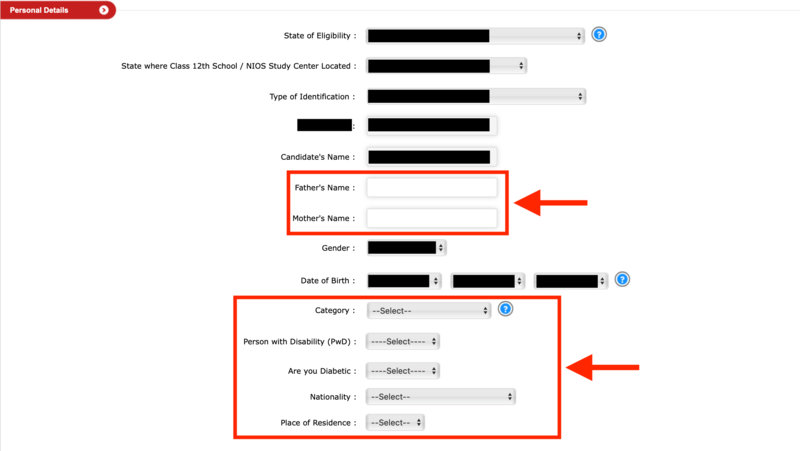 Fill the remaining Personal details including Father’s Name, Mother’s Name, Category, Nationality and PwD status. Enter your Mailing Address, Mobile and Email Address. Enter your Qualifying Examination details including Board, Year of Passing/Appearing and School details. Enter your Guardian details like Qualification, Occupation and Annual income. You can also skip this step. Choose a Password and a Security Question-Answer. Enter the Security Pin as displayed and click on “Submit and Review”. “Review Page” popup will appear. Verify all the details and check each of the checkboxes under “Parameters Verification Checklist”. Check the “I agree” checkbox and click on “Submit”. A confirmation popup will appear. Click on “Yes, Please Do”. An application number will be generated. At any time, if you get logged out or want to fill form later, you can login again using the chosen password. Next step requires the candidate to upload images. Once you’re ready with the scanned image of yourself and your signature, click on “Upload Scanned Images” to continue. Candidates must ensure that scanned photograph has proper name and date of photo taken. Upload your scanned Photograph and Signature in JPG format. The scanned Photograph file size must be between 10KB to 200KB and the scanned Signature file size must be between 4KB to 30KB. Click on “Preview”. Check the “I have verified my Photograph and Signature and found correct” checkbox and click on “Final Upload”. Next step requires the candidate to pay the Application Fees. Click on “Pay Examination Fee” to continue. A confirmation note will be displayed. Candidates are suggested to go through the note and click on “Review Application” to recheck their details. Once checked, candidates need to click on “Go to Fee Payment”. Candidates who have appeared for the January exam are not required to compulsorily take the test again though if a candidate appears in both the tests, the better of the two scores will be considered.